We at TnT Paranormal Investigators LLC are big on serving our community and helping others. We feel that by helping others we will help ourselves. This is one of the core values of our team. 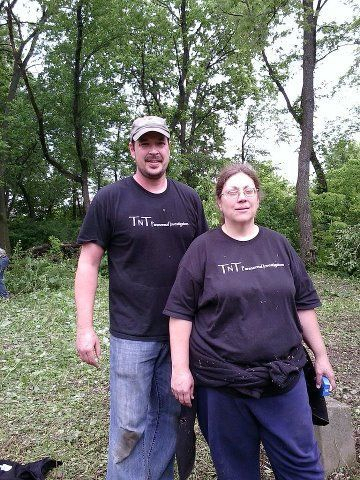 In May of 2012 we assisted Champaign / Chicago Illinois Paranormal Society (C.H.I.P.S) and Into the Night Paranormal at the Will County Poor Farm Cemetery for a cleanup project. In April of 2011 we returned to Countryside Place to continue the cleanup efforts we kicked off last summer. It is always fun to go visit this historic home. On March 26, 2011 TnT Paranormal and several other paranormal teams spent the day assisting the owners of Morgan Cottage with the removal of trash, debris, and years and years of dirt/dust. Unfortunately, the years, weather, and vandals have not been kind to this historic building. As hard as we worked, we barely made a dent in the cleanup process; which has to be completed before restorations can begin. We had a great time and enjoyed meeting with other paranormal teams. Some of the teams we met were: CHampaign Illinois Paranormal Society, Into the Night Paranormal, S.N.A.P.I.T., West Chicago Paranormal, Midwest Haunts, and Chicago Paranormal Seekers. In 2010 and 2011 we spent several hours (over several days) sweeping, mopping, dusting, and removing cob webs from the historic Victorian style home in Manteno, IL called Countryside Place. We have presented at over 30 area libraries, park districts and museums on several topic of paranormal. These presentations are designed to educate the patrons on the paranormal and where to go if they need assistance. To learn more about the Paranormal Lecture Series go to the Events page.